Dermablading at The Wellness Clinic. Our Senior Skin Consultant, Jayne has been offering this treatment since 2005. 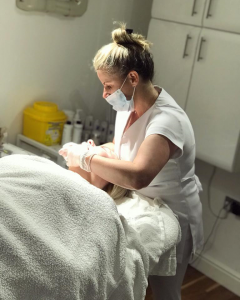 During the dermablading procedure, we use a unique device with a very fine sterile blade to remove these hairs, along with the top layer of dead skin cells. Dermablading minimizes pore blockage and encourages the production of collagen and elastin. It can also eliminate several skin complaints and treat skin damaged by acne and bacterial infection. What to expect during your treatment. At the start of the procedure, we cleanse the treated area and ensure everything is sterile. We then carefully scrape the surface of the clean, dry skin with the specially-designed surgical scalpel. The blade moves gently over the skin. While stretching the skin, we apply pressure evenly to avoid causing any damage to the skin’s surface. The procedure usually takes about 45 minutes and is not painful. Dermablading needs little or no down time. But, to maximize results long-term, it’s important to provide ongoing care for your skin.